Classic embossed foil labels and seals add a touch of class and make a lasting impression. Perfect for wedding invitation envelope seals, certificates and other high end events.  FREE typesetting and graphic design services.  Blind embossed materials include bright and dull gold or silver.  Samples available upon request. • Add a colored foil to your embossed labels to add emphasis to your message. Foil stamp and blind emboss combination labels - The dazzling appearance of foil stamping combined with the subtle dimension of embossing creates an image that stands apart from the ordinary. Custom embossed foil labels and seals are ideal for special events, anniversaries, wedding stationery, gift seals, jewelry shops, gift shops, and more. Foil embossed labels and seals offer elegant raised print and can be custom printed in a variety of shapes, colors and combinations to create a special look and feel that cannot be duplicated with other labels. Let our graphic design team come up with a design for your special occasion. 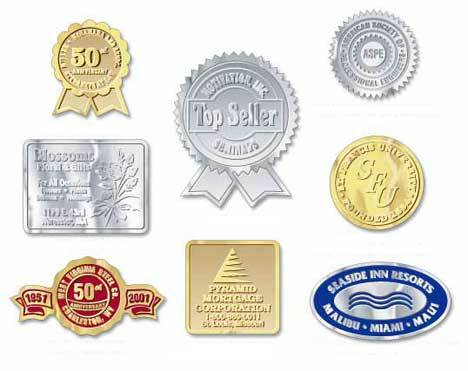 To request a quote on a custom embossed foil label or seal click here. Quantity discounts available.